Rajas counted among the best suppliers and manufacturers of Digital surgical cattery of diffrent model from 100 Watt to 400 watts, we offer best quality range of surgical cattery to our valuable clients. These are mainly used in surgeries of various kinds’ for the safety and security by using our machines It is equipped with PEEC (plate electrode electronic control), which saves the patient from various dangers of burns, due to plate contact lack age during surgery. These machines are very useful for the middle bipolar and mono polar electro-surgery. 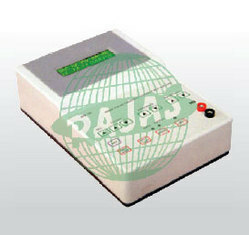 Input power required for operating it is 180-260 volts with maximum current of 3. 5 amperes for 200 watt model. Both the bipolar and mono polar requires high frequency leakage in 50ma rms and 100ma rms respectively. The power readouts works by actual power of +15% or 5 watts rated load. Indicators tones are adjustable to level of 45 db at 1 meter, whereas alarm tones are not adjustable and are set at 65 db minimum at 1 meter. the above specification is for 200 watt model detail specification of our other model is also on request. 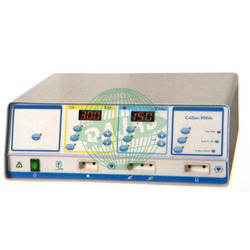 Our ECT Machines delivers pulsed, bi-directional square wave stimulus. The current is constant at 0. 9 ampere and the voltage varies automatically by a built in microcomputer as per the impedance of the patient. We conceived and designed the rajas keeping three major considerations in mind i. E. Its stimulus parameters had to be chosen on the basis of research data. (Maxwell 1968, weaver teal 1977 wiener 1980). It should have the capacity to produce seizure virtually 100%. It should be safe and easy to operate. Parameters display on LCD. Auto stimulus voltage. Auto impedance check. Output display in joules as well as in milli coulombs. In built rechargeable battery with charger. Over 2500 satisfied customers.